We’re pleased to announce our most recent collection: petite pave rings. These wedding bands and engagement rings are delicate and finely styled. It’s perfect for the woman who wants a delicate and subtly eye-catching ring. What does pave mean exactly? Pavé settings are made up of lots of small gemstones, often diamonds or moissanite, set closely together. The gems are separated and held in place by little beads of the setting metal. The result is what looks like a continuous surface of diamonds or other gems. Here are a few samples below. Or stop by here and take a look at our entire collection. Petite Pave' Engagement Ring With Prong Set Round Side Stones From the Petite Pave' Collection: Split shank engagement ring with approximately 1/6ct t.w. 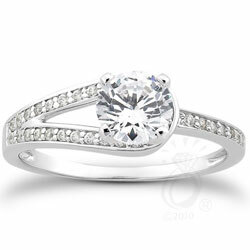 prong set round brilliant diamond side stones (setting only, does not include center stone). 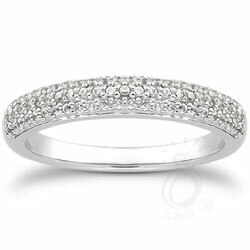 Style 10513WB Petite Pave' Wedding Band With Prong Set Round Stones From the Petite Pave Collection: Matching prong set wedding band with approximately 1/4ct t.w. round brilliant stones. 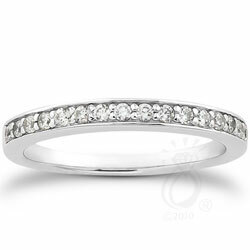 Petite Pave' Wedding Band With Round Diamonds From the Petite Pave' Collection: Matching wedding band with approximately 2/5ct t.w. round brilliant diamonds.